RS Components offers a wide range of top quality, long lasting, high security padlocks for both commercial and residential use. 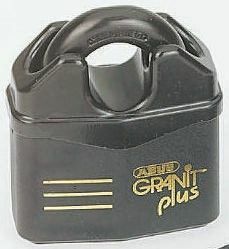 Padlocks are portable locks equipped with a shackle that can be pushed through an opening and secured. High security padlocks act both as visual actual deterrents against theft. They come in various sizes ranging from 10 mm to 300 mm shackle length. 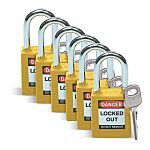 Our extensive range of padlocks offer a choice of combination, heavy duty, key or smart (Bluetooth) lock type; manufactured from bronze, titalium, aluminium, brass, stainless steel, laminated steel or hardened-steel for extra protection. Many are weatherproof padlocks, or corrosion-resistant and weather resistant padlocks for outdoor use. 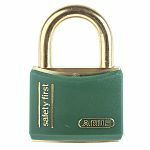 Plastic covered padlocks equipped with plastic shackle are ideal for electrical application and offer superior resistance to chemicals and temperature. Keyed Alike padlocks guarantee that when you use a number of padlocks of the same size and type, the keys from each padlock will also operate all the others. This is an especially useful feature where multi-user access is a requirement. 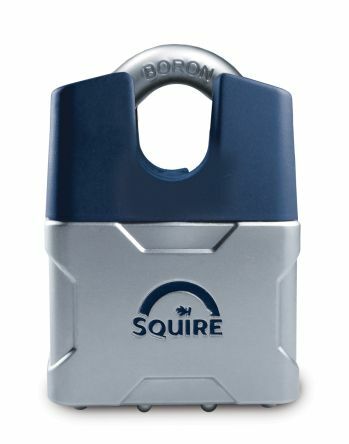 Bear in mind the working environment: for outdoor use, a waterproof padlock and anti-corrosion padlock is recommended e.g. for locking a bike up at night; for indoor use, a simple padlock can fulfil the task. 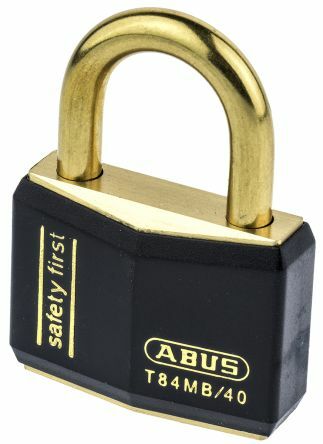 When working with electrical appliances, a plastic covered padlock is recommended. These padlocks offer extra security and user protection. Combination or Bluetooth padlocks are a good choice for multi-user operation whereas Keyed Alike padlocks simply restrict access to only a few users.